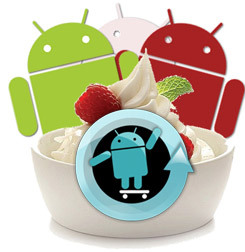 con kernel 2.2.1 (come la Xeno V10)e poi applicare l'update! Questa ROM va installata come se fosse un UPDATE!!! Potreste usare questo link per tenervi aggiornati sulle versioni! wifi test - those who are experiencing wifi issues, please test this build made from alternative wpa_supplicant6 and ti wilink sources and report, thanks. - now playing/album art on lockscreen etc. Qualche giorno fa Motorola ha rilasciato i sorgenti della 2.2 del DroidX, la cui piattaforma hardware è molto simile a quella del Milestone, e vedendo le differenze del kernel tra la leaked del Milestone e quello del Droid X, si nota che entrambe sono uguali!! Il famoso nadlabak ha allora potuto usare quei sorgenti come base per compilare alcuni moduli e librerie da lui modificate e rendere così il tutto compatibile il più possibile col Milestone. La maggior parte dei bug che affliggevano la versione precedente ora sono stati risolti!! - added ro.config.no-action-on-plug property. When set to 1, the screen will not automatically turn on when plugged to usb/power (useful especially for users of solar power adapters). Disabled by default, can be changed in /system/build.prop. - AAC and AMR Wideband audio encoders are finally working! - ignore light sensor when flashlight is on (better solution based on updated flashlight code), SMS time stamp fix, input method chooser dialog fix, smartass governor included etc. Note: there is a leftover backup file /etc/init.d/10overclock~, please delete it, thanks and sorry for the inconvenience. - Launcher Pro 3D drawer scrolling fix, SMS TP-Data-Coding fix, flashlight code clean-up, Torch app, national roaming fix, multitouch fixes, notification LED fixes, EAP phase 2 fix (wifi), toast message for ScreenTimeout button etc. - kernel modules update: from now on, the overclock and interactive governor modules use the new symsearch module (good work, Skrilax_CZ! ), so they can find the needed symbol addresses automatically. Therefore any future kernel upgrades or downgrades should be painless - there will be no need to find and specify the addresses manually anymore. - added support for dalvik.vm.dexopt-cache-only property in build.prop - when set to 1, dalvik-cache of all apps will be stored in /cache only (default is 0 - system apps have dalvik-cache in /cache, data/sdcard apps in /data). No need to use the memhack/dalvik-cache hack anymore, simply set this property and delete the caches from OR and you're ready. - when the usb is connected during boot, you will have to disconnect and reconnect the usb cable before you can mount the SD card to a computer. chmod 644 /system/etc/init.d/02adb_during_boot will disable the early adb mode and the mount will be possible immediately. Early adb is enabled by default (well, it's alpha, right? ).